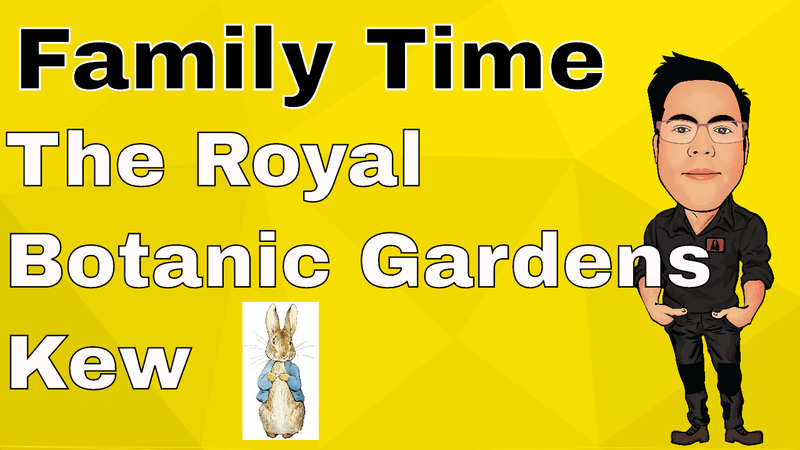 My wife had arranged to spend the morning with her school friend and her family at The Royal Botanic Gardens Kew, mainly for the Easter Exhibition – A big day out with Peter Rabbit. Kew gardens is close to us, in fact for my family we are just over 5 miles away and a 20 minute drive. It’s one of the places we used to visit when we moved to London but never been back with our children. So, the Peter Rabbit exhibition was a great excuse to visit this amazing open space here in London. With over 250 years of history and 326 acres of land to explore, there was no way the kids or even us adults would get bored. We headed straight to meet my wife’s friends at The Peter Rabbit exhibition. We probably spent about 10 minutes walking around the Peter Rabbit exhibition. In all honestly it was a bit of a let-down, the kids could make bunny ears out of pipe cleaners, plant some sun flower seeds and then using the printed map, get some Peter Rabbit stamps. Also, on offer at the Peter Rabbit Big Day out, was a story teller the chance to have a go at willow weaving. * The Hive is a unique, multi-sensory experience designed to highlight the extraordinary life of bees. A feat of British engineering, it stands 17 metres tall, set in a wildflower meadow. The sound and light intensity within The Hive is triggered through vibration sensors inside a real beehive, and you can hear the live activity of worker bees going about their business, so every visit to The Hive is different! This 40-tonne lattice structure creates an incredible multi-sensory experience of what it’s like to be inside a real bee hive, and explores the vital role of bees in feeding our planet. I’ve seen photos of The Hive online, but never seen it for real. It’s an amazing structure. Just standing there and looking at it and wondering how it was built. It’s great to get kids learning about bees, the noises bees make. It’s a must to see. After our walk around The Hive, we headed to the Princess of Wales Conservatory, 10 climate zones all under 1 roof. Grace really enjoyed running around and exploring the “jungle” area and looking for the hidden Poison Dart Frog. Sadly, this was to be the last leg of our visit to Kew Gardens, with all 3 kids under 5 completed zonked, we headed back to our car. I really wanted to see the Treetop Walkway– a walk 18 metres above the woodland floor through the tops of trees and also the Bamboo Garden and Minka House. I’m pretty sure we will be returning pretty soon when the weather turns warmer. All in all, it was a great day out. If you haven’t visited The Royal Botanic Gardens Kew, I would highly recommend it. We had an enjoyable day out and exploring Mother Nature and her amazing Trees and Plants.